What is Mixed Content Warnings? Why mixed contents error is bad? To learn more about the outcomes of such errors, we recommend reviewing this amazing video by TroyHunt. How can you get rid of ‘Mixed Contents’ SSL error? First, the simplest way is to enclose the implicit content with HTTPS (needs coding). Make the use of relative URL. With this in hand, the page will be having a HTTPS resource if it gets loaded on the HTTPS. Last but not least; test the website frequently. As people will not prefer to buy from a websites throws browser errors on SSL security. Frequent testing will help your to solve the error on real time. SSL is the best innovation that guarantees a sound security of your customer’s confidential information. Common mistakes like installation fault, failing to renew the SSL certificate and the mixed contents may place your website at risk and hence it must avoided. Be a little more concern and ultimately earn more. 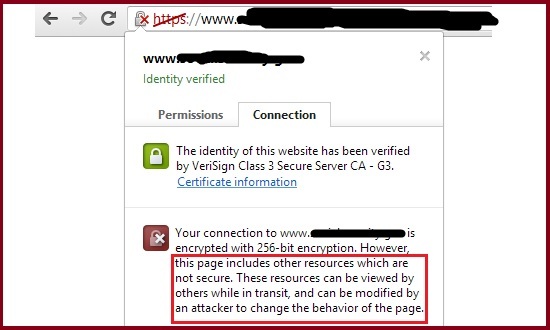 Previous PostPrevious Is Your Browser Throws Security Warning? Think Before You Access!